Munich Re has designed a fun and educational game that lets the user play the part of a hacker, pick a target, and guess the damage caused. Designed in a nostalgic 80’s 8 bit style, WhatTheHack uses real-life case studies. You can choose from targets including a cookie factory, a hospital or a dating website. You also get your choice of attack strategies. Try it out and see if you can get your name on the leader board by correctly answering questions about the impact of each attack. 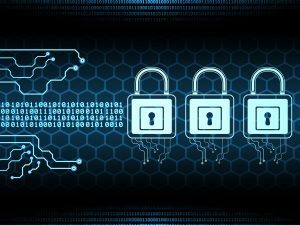 Cyber incidents hit one of every 10 U.S. small businesses last year yet only 31 percent of them have cyber insurance. 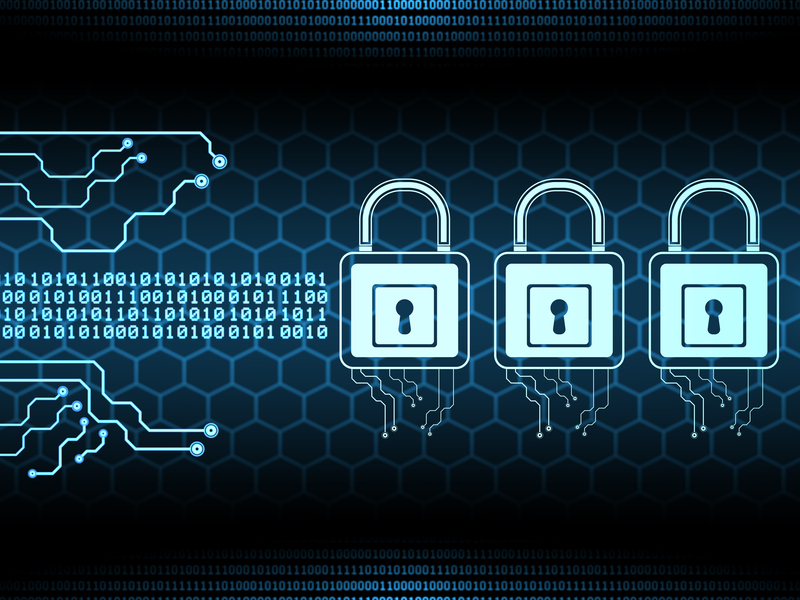 Ten percent of the small businesses surveyed had one or more cyber incidents in 2017, resulting in a typical loss of $188,400, an increase of $73,000 from the year before. Read more about it here. 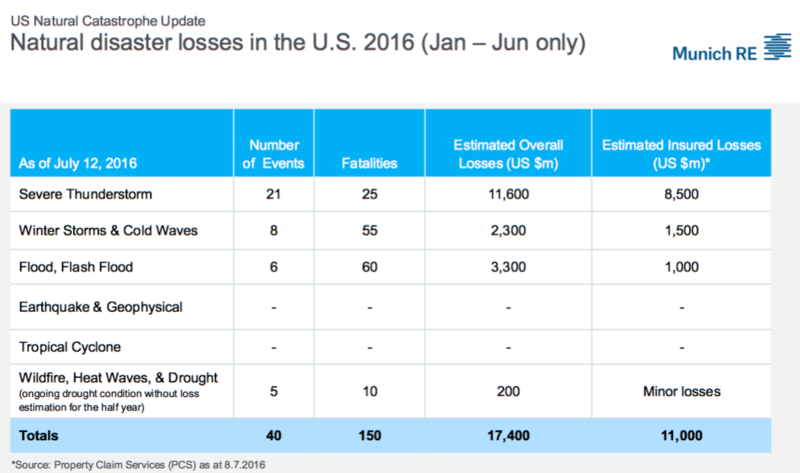 Severe thunderstorms accounted for the lion’s share of U.S. natural disaster losses in the first half of 2016, according to Munich Re. Of the $17 billion in U.S. economic losses ($11 billion insured) caused by natural catastrophes in the first half of 2016, some $12.3 billion ($8.8 billion insured) were due to a series of storms in Texas and neighboring states, including destructive hailstorms in Dallas and San Antonio, and severe flooding in the Houston metro area. 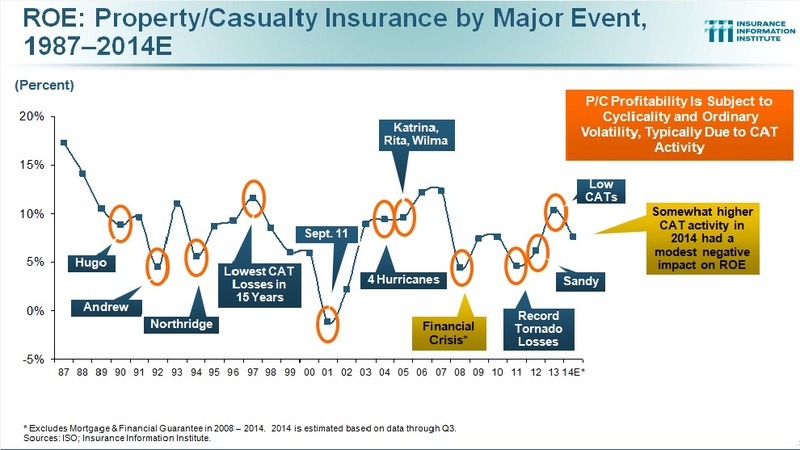 Winter storms and cold waves were the next most costly U.S. peril in the first half causing insured losses of $1.5 billion, followed by flood and flash flood events with $1 billion in insured losses. 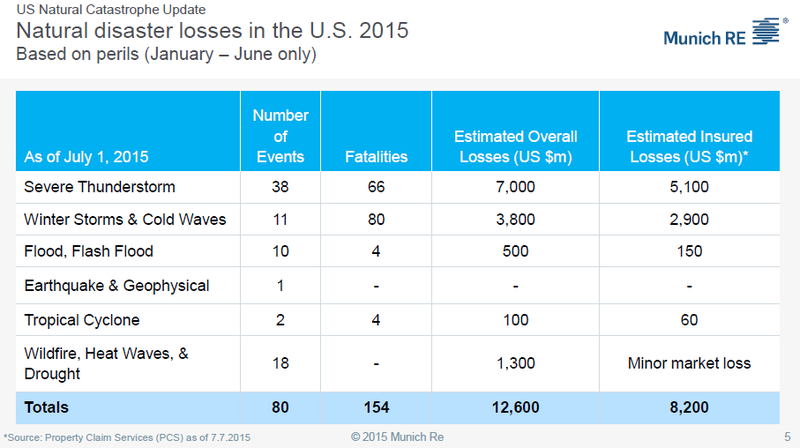 Wildfire, heatwaves and drought resulted in minor insured losses, and there were no losses due to earthquake or tropical cyclones in the first half, according to Munich Re’s Nat Cat Update. Weather extremes in Texas and other southern states are symptomatic of an El Niño phase, which intensifies the subtropical jet stream, which can cause an increase in severe storms in the region, Munich Re said. Further north, El Niño conditions also caused warm and dry conditions in Alaska and western Canada, helping to trigger the worst wildfire in Canadian history. Direct losses from these fires totaled $3.6 billion, of which $2.7 billion were insured. The Fort McMurray fire has been declared the costliest natural catastrophe event in Canada’s history. One beneficial aspect of El Niño conditions is that it tends to reduce springtime tornado activity over the southern Great Plains. 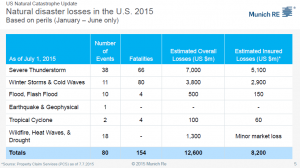 While the year’s thunderstorm season got off to an early start, the states of Texas, Oklahoma, and Kansas have all seen about 50 percent fewer tornadoes this year than in the first half of 2015, Munich Re observed. 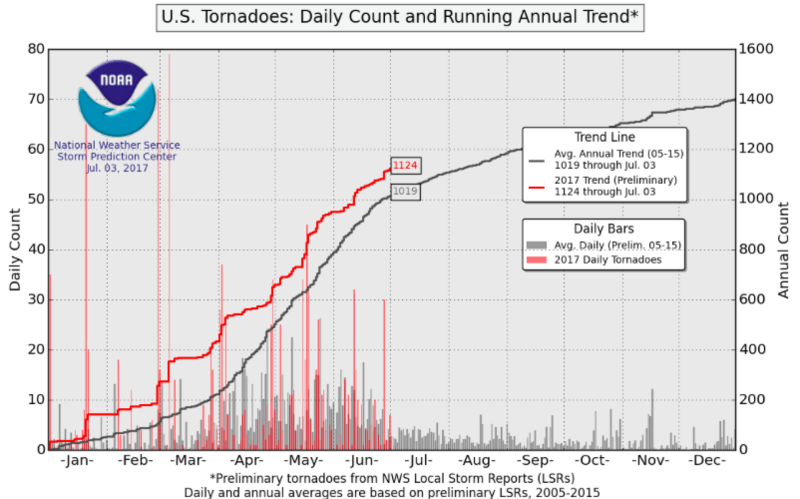 Nationally, the number of observed tornadoes was about 700 by the end of June, significantly below the average of 1,021 for the last 10 years. Tony Kuczinski, president and CEO of Munich Re America, Inc, noted that homes and businesses incur the brunt of thunderstorm losses. To help homeowners build safer, stronger structures in the face of increasing severe weather events, Munich Re and the Insurance Institute for Business and Home Safety (IBHS) recently launchd an app that walks homeowners, contractors and architects through the home strengthening process. FORTIFIED HomeTM On the Go can be downloaded free from the iTunes Store. U.S. natural catastrophes accounted for almost one quarter of worldwide economic losses in the first half of 2016, and about 58 percent of global insured losses.